Preparations begin at Castle Golga for the annual festival of the undead, as a pair of fearless vampire killers question a man hidden away in a monastery on the Baltic Sea. The mysterious Mr. Higgins wants nothing more than to avoid the scene of his wife's death, and the truth about what happened to him in that castle. However, these heroic men sworn to rid the world of the vampire scourge inspire Higgins to venture out and to end the only suffering he really cares about--his own. 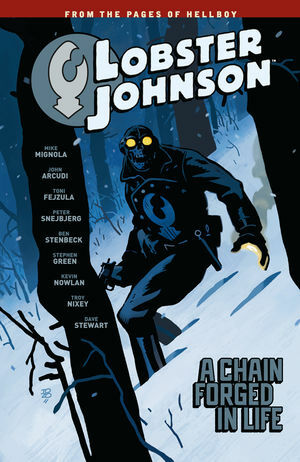 This sendup of classic vampire stories sees Mignola teaming with British artist Warwick Johnson-Cadwell (Solid State Tank Girl, No. 1 Car Spotter) for an original graphic novel as outlandish as The Amazing Screw-On Head.